Oregon, IL – April 11, 2019 – On Wednesday, April 10, officials from Ogle County, Gilbane Building Company, HOK Group, Inc., trade contractors and the community came together to celebrate the official groundbreaking for the New Ogle County Judicial Center Annex. The new 154-bed jail facility will consist of multiple sections utilizing direct supervision methods for males and females in custody. Anticipated areas will include public access, video visitation, administration, holding and intake, medical, kitchen, laundry, inmate property storage and a vehicular sally port. A corridor will connect the existing judicial center to the new sally port. 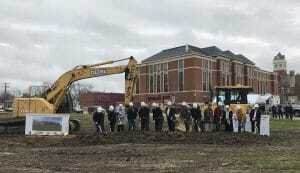 “Gilbane is excited to partner with Ogle County on the construction of this new jail facility. We look forward to working closely with all project stakeholders to deliver a quality building that will serve the citizens of Ogle County for many years to come,” said Tom Leonard, Gilbane Building Company Senior Project Executive. Gilbane is providing construction management services on this new jail project and project completion is set for November 2020. Gilbane has two permanent offices located in Chicago, as well as an extensive knowledge of the Chicagoland market including construction processes, area subcontractors/suppliers, local M/WBE contractors, and familiarity with Chicago jurisdictional authorities. With more than 40 years of success in the highly competitive Chicagoland market, Gilbane is committed to continuing the strong tradition of excellence in the Chicago construction industry.